Licensed Bar in the Village Hall from Midday to 10.30pm organised by Phil our Chief Bar Steward!! The Tucker's Arms will be open all day. Our delightful Landlady is Tracey. The Dalwood Shop will be open for sweets, ices, biscuits & drinks etc. Call in and see what's on offer. drive very carefully. Parking Stewards will be on duty. There will be a designated parking bay for Disabled Music Lovers by the Church. Sue & Graham , for Visitors to the Dalwood Music Day. Perhaps you'd like to sit & eat your BBQ in the Garden! 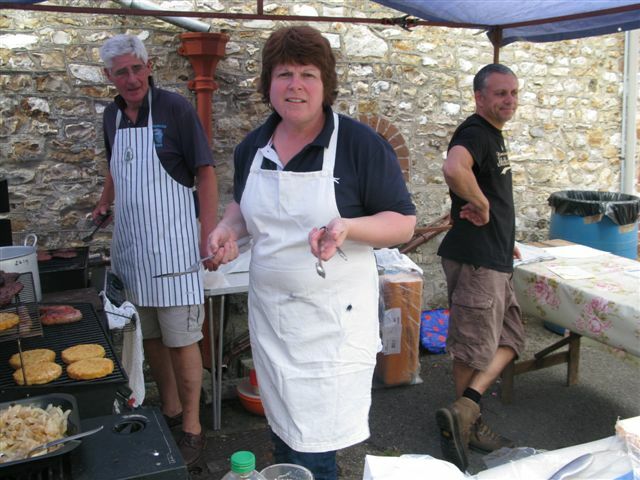 THE LADIES OF THE DALWOOD RAFT CLUB cook & serve the best tasting beefburgers in East Devon! The BBQ is outside the Village Hall. You can take your food into Sue Giles' garden next to the Hall where tables & chairs will be provided.